Many industries — including construction, agriculture, mining, and material handling — as well as the military rely on mobile machines for their operations. These machines work under extremely harsh conditions, which tax the level measuring instrumentation used to maintain efficient and safe processes. Consequently, there is a need for robust, stable, and reliable sensing instruments to monitor and control fluid levels and to ensure performance and safety. Magnetic float level switches are a suitable option to measure fluid levels in tanks and reservoirs in mobile machinery. Mobile machines, such as bulldozers, tractors, cranes, and industrial trucks, operate in rain or shine. Ambient temperatures can be scorching or below freezing. Vibration produced by hydraulics, engines, and gear drives can affect measuring instrumentation. Shock from flying debris, machine impacts, and ground waves, as well as electromagnetic interference from motors and drives, can impact measurements. Chemicals, fuel, engine oil, and hydraulic oil can cause corrosion. Internal stresses, such as cavitation, pressure spikes, and changing loads, also put a toll on measuring instrumentation. Level indicators for mobile machine applications must be capable of withstanding these tough conditions in order to provide accurate and reliable information. Only proven technologies and careful design can ensure that measuring instrumentation works well when the environment is unforgiving. The simple yet effective design of WIKA’s HLS-M series makes these miniature magnetic float level switches suitable for a wide range of liquid level monitoring and liquid level indication in mobile machines. HLS-M switches are compact, easy to mount, reliable, and can withstand extreme operating conditions. A magnetic float switch from the HLS-M series is a solid, economical solution to monitor levels of liquids in hydraulic reservoirs and tanks in mobile machines. In these switches, a float is mounted on a hinged, swiveling lever and moves with the level of the liquid being measured. A built-in, permanent magnet triggers a reed switch when the float reaches a preset switch point. The magnet and the reed switch provide non-contact switching operation and do not require a power supply. Non-contact operation is free from wear and offers a long and maintenance-free life. 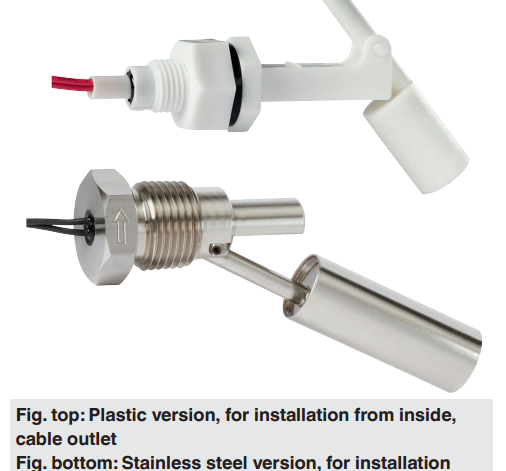 HLS-M switches come in plastic or stainless steel, and with different thread connections for easy installation inside or outside the reservoir or tank. The HLS-M switches require little space, making them ideally suited for small tanks and reservoirs. Assemblies come standard as a normally open contact, but can be used as normally closed by rotating it 180 degrees. HLS-M switches work with fluids between -40°F and +248°F. Cable length can be customized upon request. HLS-M switches are mounted horizontally and are perfect for measuring maximum and minimum liquid levels. Mounting, commissioning, and operation costs are low. Call WIKA’s experts today. They have years of experience in the field and can help you select the liquid level measuring instrumentation that fits your mobile machine application’s particular needs.